city soon after the blast. world. On this day a single bomb dropped by a single airplane destroyed the city, leading to the end of World War II and introducing mankind to the Atomic Age. "The hour was early; the morning still, warm, and beautiful. Shimmering leaves, reflecting sunlight from a cloudless sky, made a pleasant contrast with shadows in my garden as I gazed absently through wide-flung doors opening to the south. Suddenly, a strong flash of light startled me - and then another. So well does one recall little things that I remember vividly how a stone lantern in the garden became brilliantly lit and I debated whether this light was caused by a magnesium flare or sparks from a passing trolley. Garden shadows disappeared. The view where a moment before had been so bright and sunny was now dark and hazy. Through swirling dust I could barely discern a wooden column that had supported one comer of my house. It was leaning crazily and the roof sagged dangerously. Moving instinctively, I tried to escape, but rubble and fallen timbers barred the way. By picking my way cautiously I managed to reach the roka [an outside hallway] and stepped down into my garden. A profound weakness overcame me, so I stopped to regain my strength. To my surprise I discovered that I was completely naked How odd! Where were my drawers and undershirt? All over the right side of my body I was cut and bleeding. A large splinter was protruding from a mangled wound in my thigh, and something warm trickled into my mouth. My check was torn, I discovered as I felt it gingerly, with the lower lip laid wide open. Embedded in my neck was a sizable fragment of glass which I matter-of-factly dislodged, and with the detachment of one stunned and shocked I studied it and my blood-stained hand. Yaeko-san, pale and frightened, her clothes torn and blood stained, emerged from the ruins of our house holding her elbow. Seeing her, I was reassured. My own panic assuaged, I tried to reassure her. She nodded, and I motioned for her to follow me." Dr. Hachiya and his wife make there way to the street. As the homes around them collapse, they realize they must move on, and begin their journey to the hospital a few hundred yards away. "We started out, but after twenty or thirty steps I had to stop. My breath became short, my heart pounded, and my legs gave way under me. An overpowering thirst seized me and I begged Yaeko-san to find me some water. But there was no water to be found. After a little my strength somewhat returned and we were able to go on. I was still naked, and although I did not feel the least bit of shame, I was disturbed to realize that modesty had deserted me. On rounding a corner we came upon a soldier standing idly in the street. He had a towel draped across his shoulder, and I asked if he would give it to me to cover my nakedness. The soldier surrendered the towel quite willingly but said not a word. A little later I lost the towel, and Yaeko-san took off her apron and tied it around my loins. Our progress towards the hospital was interminably slow, until finally, my legs, stiff from drying blood, refused to carry me farther. The strength, even the will, to go on deserted me, so I told my wife, who was almost as badly hurt as I, to go on alone. This she objected to, but there was no choice. She had to go ahead and try to find someone to come back for me. Yaeko-san looked into my face for a moment, and then, without saying a word, turned away and began running towards the hospital. Once, she looked back and waved and in a moment she was swallowed up in the gloom. It was quite dark now, and with my wife gone, a feeling of dreadful loneliness overcame me. I must have gone out of my head lying there in the road because the next thing I recall was discovering that the clot on my thigh had been dislodged and blood was again spurting from the wound. & dark portions of her komono. I tried. It was all a nightmare - my wounds, the darkness, the road ahead. My movements were ever so slow; only my mind was running at top speed. In time I came to an open space where the houses had been removed to make a fire lane. Through the dim light I could make out ahead of me the hazy outlines of the Communications Bureau's big concrete building, and beyond it the hospital. My spirits rose because I knew that now someone would find me; and if I should die, at least my body would be found. I paused to rest. Gradually things around me came into focus. There were the shadowy forms of people, some of whom looked like walking ghosts. Others moved as though in pain, like scarecrows, their arms held out from their bodies with forearms and hands dangling. These people puzzled me until I suddenly realized that they had been burned and were holding their arms out to prevent the painful friction of raw surfaces rubbing together. A naked woman carrying a naked baby came into view. I averted my gaze. Perhaps they had been in the bath. But then I saw a naked man, and it occurred to me that, like myself, some strange thing had deprived them of their clothes. An old woman lay near me with an expression of suffering on her face; but she made no sound. Indeed, one thing was common to everyone I saw - complete silence. All who could were moving in the direction of the hospital. I joined in the dismal parade when my strength was somewhat recovered, and at last reached the gates of the Communications Bureau." Hachiya, Michihiko, Hiroshima Diary (1955); Hersey, John, Hiroshima (1963). 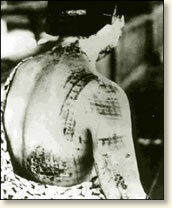 "Surviving the Atomic Attack on Hiroshima, 1945," EyeWitness to History, www.eyewitnesstohistory.com (2001). Approximately 80,000 people lost their lives in the blast. The incendiary raid on Tokyo took a greater toll, but the devastation at Hiroshima was the result of one bomb and one plane. The atomic bomb dropped on Hiroshima contained a mass of uranium about the size of a baseball. 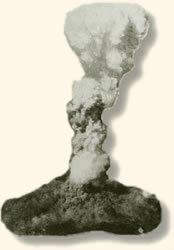 The explosion it unleashed was the equivalent of that of 20,000 tons of TNT. 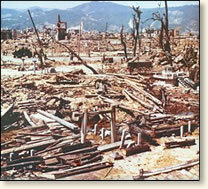 The estimated population of Hiroshima in 1945 was 350,000. Today it numbers more than 1 million. A second Atomic Bomb was dropped on the city of Nagasaki three days later.